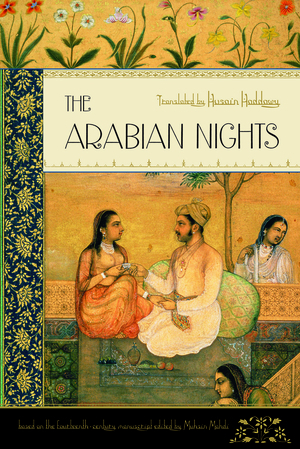 Some of the books, such as "The Arabian Nights," do have beautiful covers. The "Washington Times" illustration for this article. Bainbridge State College's Library received a $4,500 grant from the National Endowment for the Humanities (NEH) and the American Library Association (ALA) to host a five-part reading and discussion series titled "Let's Talk About It: Muslim Journeys." BSC Vice President for Academic Affairs Tonya Strickland said the book discussions would be memorable experiences. … The books to be discussed are "Broken Verses" by Kamila Shamsie, "Dreams of Trespass" by Fatima Mernissi, "House of Stone" by Anthony Shadid, "In the Country of Men" by Hisham Matar and "Persepolis: The Story of a Childhood" by Marjane Satrapi. The discussion series will run from this September to March 2014. June 18, 2013 update: Another grant, this one also for $4,500 from the National Endowment for the Humanities and the American Library Association, to Eastern Illinois University's Booth Library to host "Lets Talk About It: Muslim Journeys." "We are delighted to have been chosen to host this unique series that will allow citizens of East Central Illinois a chance to explore and discuss some important themes in Muslim history and literature with the help of well-qualified scholars," said Allen Lanham, dean of library services. … Through the grant, the library will host a five-part book discussion moderated by these project scholars and Booth Library staff. A limited number of free books will be available for participants in the series. … In association with the grant, Booth will sponsor a semester-long programming series on Muslim culture during the spring semester of 2014. … All events will be free and open to the public. We are excited for the opportunity to offer our patrons this unique scholarly experience right here at their local library. The 'Let's Talk About It' series is the equivalent of a college-level class, except it's free and there are no exams. … The Muslim journey through time has impacted our global humanity in profound and inspiring ways. Reading these books and joining these discussions may challenge some of your ideas about the past, but, hey, let's talk about it. Ameena Mirza Qazi of CAIR. July 22, 2013 update:The University of Redlands in California has announced its "Muslim Journeys" events. It's got the usual verbiage ("Learn more about the peoples, places, histories, faith, and cultures of Muslims in the United States and around the globe"), with one difference: the second of three speakers is Ameena Mirza Qazi; the ad does not give her affiliation but she is deputy executive director and staff attorney at the Los Angeles office of the Council on American-Islamic Relations ("She handles legal cases and provides legal advice to community members on civil rights issues"). So, (1) the U.S. government is legitimating a CAIR apparatchik and (2) the taxpayer is funding her. Aug. 5, 2013 update: The Reporter-Herald of Loveland, Colorado, provides a purple-prose account ("opportunity to escape from the heat of summer and cool off with the wonders of the Islamic world and its art") of the Muslim Journeys offering at the public library. "Gilpin Library Footnotes," The Mountain Ear (Colorado), August 22, 2013. "Daisy Khan, Muslim Women's Activist and 'Ground Zero Mosque' Proponent, to Keynote 'Muslim Journeys' at LIU Post," Long Island University Post, September 16, 2013. Hatem Bazian, "I am leading five sessions in the Contra Costa Public Library with the Connected Histories Theme." Yahoo Groups, October 8, 2013. 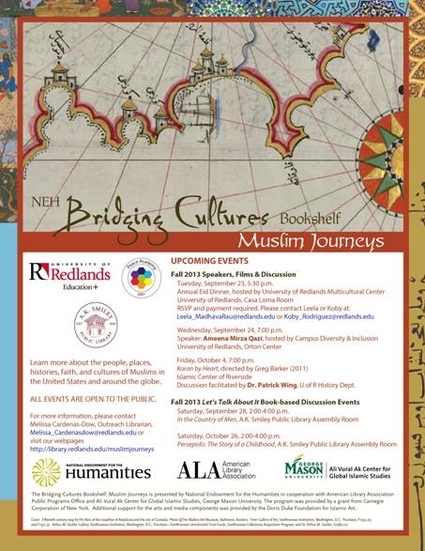 Westland Public Library, "Bridging Cultures: Muslim Journeys." October 19, 2013 and forward. Partnering with the Council on American-Islamic Relations, CAIR. Phil Bolton, "Islamic Speakers Bureau to Honor DeKalb Library and Marist School." October 23, 2013. Islamic Speakers Bureau to Honor DeKalb Library and Marist School, Jack Shaheen a speaker. Mike Osborne, "Muslim Journey's Bookshelf Series Continues at MTSU." November 14, 2013. About Moustafa Bayoumi discussing his book How Does It Feel to Be a Problem? Arab-American Life and U.S. Foreign Policy at Middle Tennessee State University. "Salaam alaikum" Nooruddeen began with an Arabic greeting of peace, followed by his "high hopes" for America to soon become a Muslim land. A statement, he said, we ought not have been offended by. … "Unfortunately...today education almost does not exist in America," Nooruddeen said in his first of many digressions, then going on to proclaim, "Very little education goes on in these walls;" a bold statement to make in a university setting. He cited that universities functioned primarily as a place of vocational study, despite having dropped out of high school and having never attended a university, himself. … Nooruddeen questioned our collective belief in the American ideal of "the home of the free and the brave." … Specifically, he called into question the actuality of a 747 hitting the Pentagon when taking into account the size of the hole and lack of titanium scrap at the site. … "Where's the freedom and democracy?" Nooruddeen questioned, referencing an America that would enter into wars with unprovoked countries, and close schools in order to avoid race mixing. … He then quoted Janis Joplin, saying "Freedom's just another word for nothing left to lose," and took a bow. Comment: As a taxpayer, I am especially thrilled to have had a chance to help sponsor Nooruddeen. Related Topics: Academia, Islam, US policy | Daniel Pipes receive the latest by email: subscribe to the free mef mailing list This text may be reposted or forwarded so long as it is presented as an integral whole with complete and accurate information provided about its author, date, place of publication, and original URL.